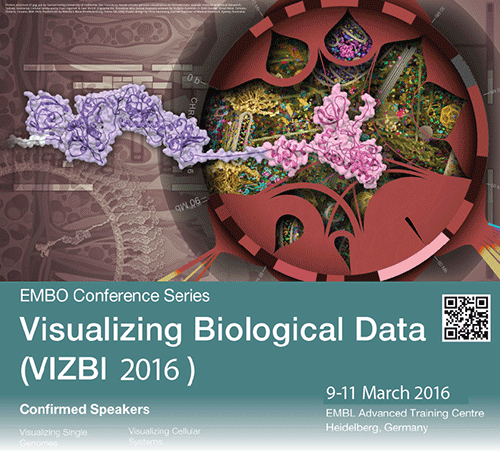 A quick reminder that registration for VIZBI 2016 (the EMBO Conference on Visualizing Biological Data) is closing soon. Registration will now close 8 February 2016 23:59 CET (extended 1 week due to server issues). The main conference will take place 9-11 March at EMBL in Heidelberg, Germany, and features keynotes (Fred Brooks, Kwan-Liu Ma, and Gaël McGill), 18 invited talks, plus posters and 1 min. flash talks. On March 8 there will also be 10 half-day tutorials related to visualizing biological data. There is also the option of remote participation (not for tutorials). If you are interested in promoting your organization or professional society during VIZBI 2016, a range of sponsorship options are still available.